For the past few months we have seen DX10 trying to take over DX9. There were several games which supported DX10. The differences between DirectX10 and DirectX 9 were quite evident but unfortunately XP users couldn’t reap the benefit of DX10 as it wasn’t supported by XP. We all know that there’s no official version of DirectX 10 for Windows XP. But some developers are trying hard to make a DirectX 10 for Windows XP. 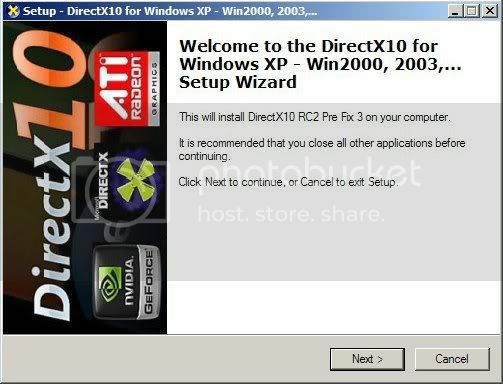 While surfing over the web I found a DirectX 10 installer for Windows XP. It supports runtimes (DLL’s) ported from DirectX10 Vista SP1 for Windows XP which helps to run games with DirectX 10 on Windows XP. Unfortunately this isn’t the final version, it’s a RC2 Pre final release but you can try it out, there’s certainly no harm in trying out. Download DX10 RC2 Pre Final Release from below and launch it. Follow the instructions on screen.